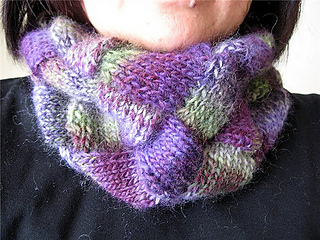 Athena is an entrelac cowl, knit in the round. Why Athena? Because after going to sleep trying to think of what to make a friend for Christmas, the idea popped out of my head the next morning, like Athena from the head of Zeus! Gauge is not critical. Athena takes about 100g/190 yards of worsted to Aran weight yarn. Choose a needle that gives you a fabric you like; I’ve used Crystal Palace Taos, Knit Picks Chroma Worsted, Noro Silk Garden, and US 8 needles for worsted, US 9 needles for Aran weight. Size will depend on your gauge; you can also size it up by adding more base triangles. Update for 2018! 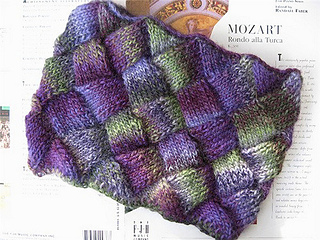 I’ve added an optional split ending that gives you the chance to try flat entrelac. 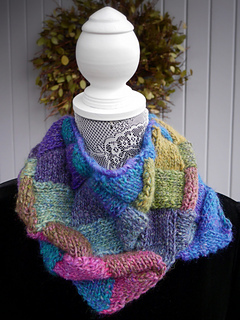 I’m teaching Athena at Madrona Fiber Arts Festival in February 2018, and wanted to spice things up! 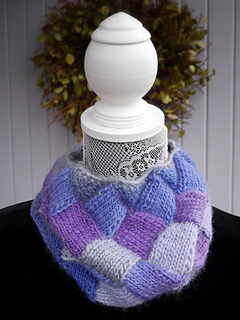 If you’ve already purchased Athena through Ravelry, you can download the update through Ravelry.